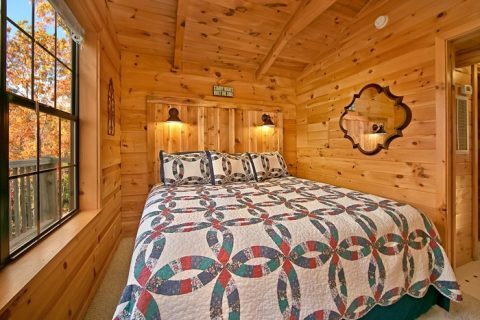 Shop and vacation from your one-bedroom Pigeon Forge cabin rental near Tanger Outlet and Dollywood! "Cloud 9's" wooded Smoky Mountains setting places guests less than 5 minutes from Tanger Outlet Mall, where you can enjoy shopping over 120 name brand outlet stores. 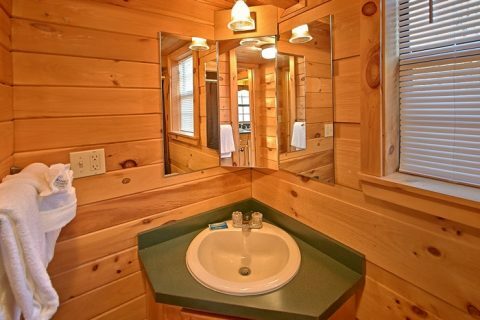 The children will love the fact your cabin is near Dollywood and dozens of Pigeon Forge's most visited attractions, shows, and restaurants. 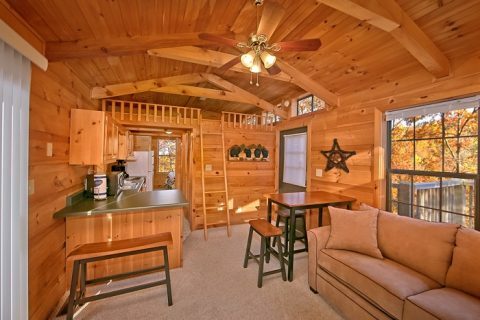 You'll feel like you're on "Cloud 9" in this elegantly furnished one-bedroom Pigeon Forge cabin! 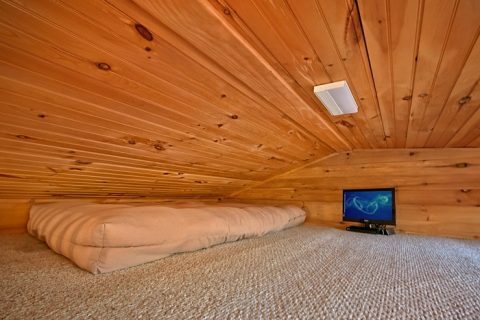 Stretch out across your king-size bed and watch television as the children enjoy their custom loft, designed just for them, with child-size mattress, personal television, and DVD player. 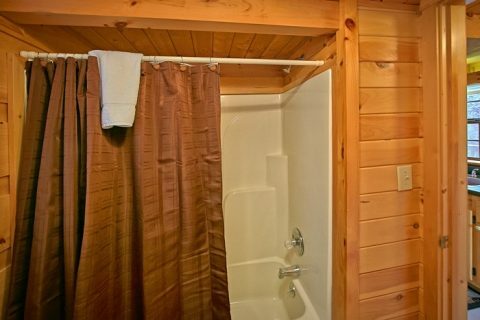 With all the adventures close to this cabin rental near Tanger Outlet waiting to be discovered there's no time to waste! Gather around the bistro dining set for four to enjoy a hearty breakfast prepared in your fully equipped kitchen. 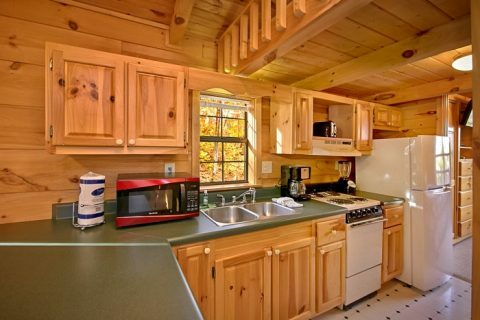 When everyone's finished their meal, toss the dishes in the dishwasher and head out for a day of fun in the Smokies! 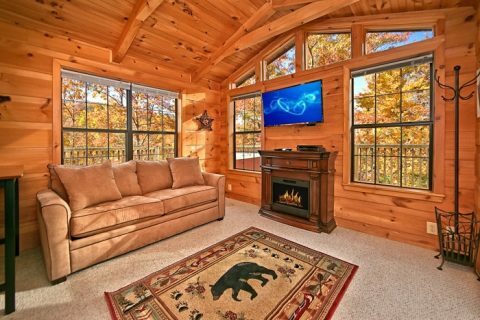 Back at your Pigeon Forge cabin rental, you'll be able to relish in all the comforts of home starting with your vacation rental's living room electric fireplace and 40-inch flat screen television. 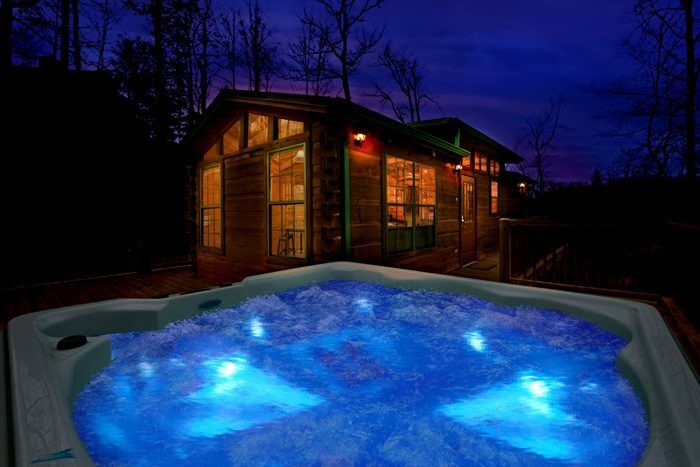 Family members can enjoy a BBQ meal hot off the charcoal grill and later take a relaxing dip in the year-round hot tub. These are the family moments that make up life's memories. 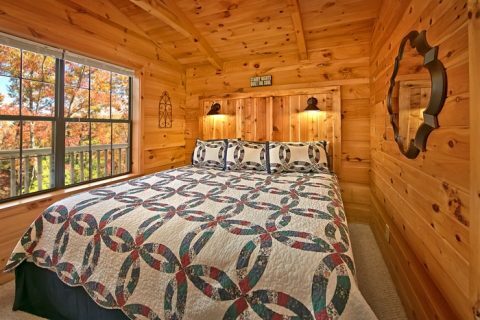 Start your family's escape to the adventurous Smoky Mountains, book your one-bedroom Pigeon Forge cabin rental near Tanger Outlet online and get an immediate Online Cabin Discount with Cabins USA!